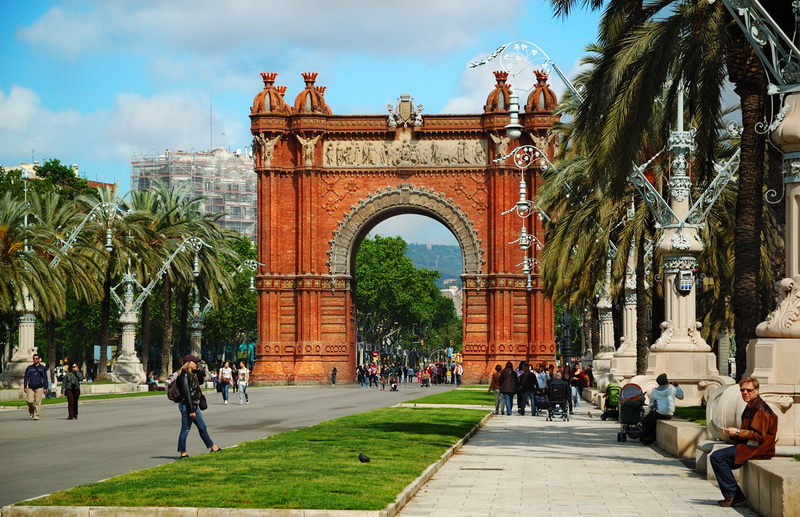 Here is yet another angle to better appreciate Barcelona's Arch of Triumph (Arc de Triomf). This time as seen from Passeig de Lluis Companys, a great site to bask in the sun, reading under a wonderful modernista lamp, ride a bike, jog or just walk. The place has been described here in Barcelona Photoblog many times so I recommend you check these popular posts. By the way, we are having a wonderful pre-spring weekend over here, fair skies, 18º C, what else could you ask for! This is a beautiful view and I love the lamps too. Thank you! wow.... i think i missed this, where exactly? Carlos, This is a wonderful photo. The image, the colors and the moment in time, reminds me of a lovely tourist photo card I would buy, if I was in Barcelona! Lily, this is near the zoo, going from Parc de la Ciutadella to Passeig de Sant Joan. Facing the mountain it is to the right hand side of the city center. Gracias María, así que cubana americana. He visto tus pinturas. Muy buenas. Cuba es un país maravilloso. Gracias por la visita.